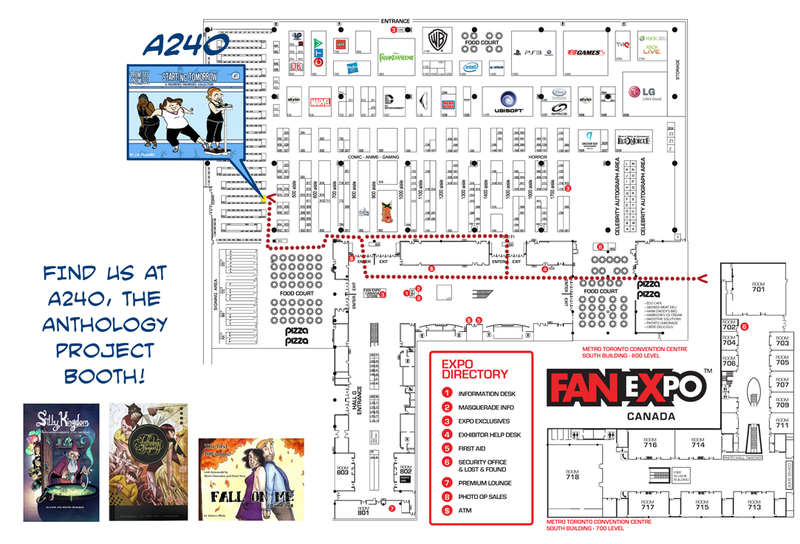 Out of the Frying Pan, Into the Fan Expo! Just finished uploading the Canfitpro photos to the Promises Promises Facebook page (here)! Although my sponsorship with them has ended, I’ve stretched the Canfitpro themed comics into this week because it was a fun show and there was certainly enough going on to inspire a few more strips. Many thanks to them, again, for the invitation! Next up: Fan Expo Canada, this weekend! Wrapping up one show and going directly into another creates a bigger scramble than I was prepared for, and Fan Expo was a bit of a last-minute add on for me so I haven’t had much chance to talk about it here, until now. It runs from Thursday to Sunday, (August 23-26) at the Metro Toronto Convention Centre. 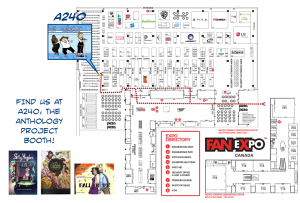 I’ll at table A240, with a new crowd of super talented folks; “The Anthology Project“, Adriana Blake, and Katie Shanahan! So, even if you’re only there to get your action figures signed, stop on by and check out our fab collection of books, prints and originals! Heck, we’ll even scribble up some commissions while you’re waiting in those celebrity lineups!